The Whitworth University Board of Trustees and President Beck A. Taylor will host a grand opening celebration Oct. 8 for the university's new $32 million William P. and Bonnie V. Robinson Science Hall. The ceremony will be part of Homecoming 2011, which also will feature a lecture by Primal de Lanerolle, a 1968 Whitworth alum and biophysicist, and a career seminar by 1968 Whitworth alum and executive coach Packard (Scott) Brown. For a complete listing of Whitworth Homecoming events taking place Oct. 6-9, please visit www.whitworth.edu/homecoming. Admission is free unless otherwise noted. 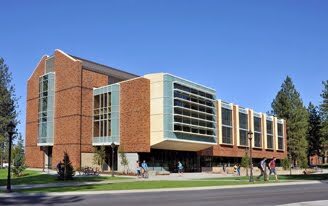 Robinson Science Hall is the largest, most expensive and most important academic facility built by Whitworth in its 122-year-history. The 63,000-square-foot building, which opened for classes this fall, houses Whitworth's biology, chemistry, and health science departments. It features state-of-the-art laboratories and instrumentation, animal-research facilities, and classrooms that can be converted to labs to meet the university's science and classroom needs for the next 20 years. The building is named after the university's 17th and second-longest-serving president Bill Robinson, and his wife, Bonnie. The grand opening celebration will be open to the public and will take place on Saturday, Oct. 8, at 11 a.m. in the front entrance to Robinson Science Hall. Bill and Bonnie Robinson will be in attendance, as will members of the Whitworth board of trustees and the Spokane community. The ceremony will conclude with an opportunity to tour the landmark new facility. Kicking off Homecoming Weekend will be a lecture on Oct. 6 by Primal de Lanerolle, a 1968 Whitworth alum who is a professor of physiology, biophysics and medicine at the University of Illinois at Chicago. De Lanerolle, who is the recipient of Whitworth's 2011 Distinguished Alumni Award, will present "From English Major to Professor of Physiology: The Enchantment of a Liberal Arts Education," on Thursday, Oct. 6, at 7:30 p.m. in the auditorium of the Eric Johnston Science Center. Homecoming also will include a career seminar by Whitworth alum, Packard (Scott) Brown, '68, who will talk about job-search tactics during his presentation, "Strategy & Faith: Partners for Your Job Interview," on Friday, Oct. 7, at 6 p.m. in Room 111 of Weyerhaeuser Hall. The cost is $5 and dessert and coffee will be provided. To register, visit www.whitworth.edu/homecoming. Brown is a veteran career consultant and executive coach whose clients have included Kellogg's, Hewlett Packard, Lockheed-Martin, and the Colorado Department of Labor and Employment. Primal de Lanerolle and several other alumni will be recognized as recipients of the 2011 Alumni Awards at the Whitworth Alumni Banquet, on Saturday, Oct. 8, at 6:15 p.m. in the Multipurpose Room of the Hixson Union Building. De Lanerolle will receive the Distinguished Alumnus Award for extraordinary service to the community and achievement in his field. Virginia (Ginny) Porterfield, '65, will receive the Alumni Mind & Heart Award for exemplifying the Whitworth mission. Travis Hartanov, '08, will receive the Recent Alumni Award for achieving significant success in his career within 15 years of graduation. John Scotford, '51, will receive in absentia the Alumni Service to Whitworth Award for his significant support of the university. • A campus tour leaving from the Hixson Union Building at 10 a.m.
• Bruce Herman art exhibit in the Bryan Oliver Gallery of the Lied Art Center from 10 a.m. to 2 p.m.
• Whitworth Pirates Football vs. Pacific Lutheran at 1 p.m. in the Pine Bowl.